What are your thoughts on freedom and immigration? 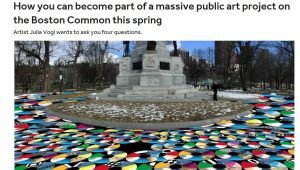 London-based social sculptor Julia Vogl wants to know, so she can weave your answers into a massive public art project she’ll install on the Boston Common next month. The project, called Pathways to Freedom, was commissioned by the Jewish Arts Collaborative (JArts), a 2-year-old nonprofit organization that promotes Jewish arts and culture. Pathways to Freedom has been 18 months in the making. 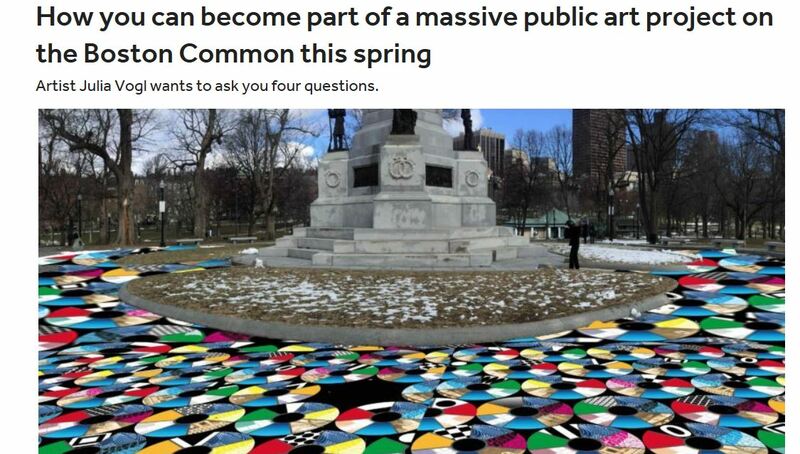 Vogl aims to include up to 2,000 Boston-area people in the project, which will culminate in a 5,000-square-foot piece of vinyl art around the Soldiers and Sailors Monument on the Common. The art will be on display from April 25 to May 2.